Six years ago, Tim Burton's Alice in Wonderland caught the early wave of the modern 3D era and became a big financial success, fairly demanding that a sequel would be forthcoming. Now the generally darker sequel has arrived, based on the generally darker book by Lewis Carroll, and once again scripted by the generally reliable Linda Woolverton. Yet beyond the financial imperative, it's difficult to discern a creative motivation for telling the new story. Since the events in the first film, Alice (Mia Wasikowska) has become a ship's captain. Upon her return home to England, she learns that her mother (Lindsay Duncan) is facing a financial crisis and that her former fiancee Hamish (Leo Bill) holds the key, so to speak. 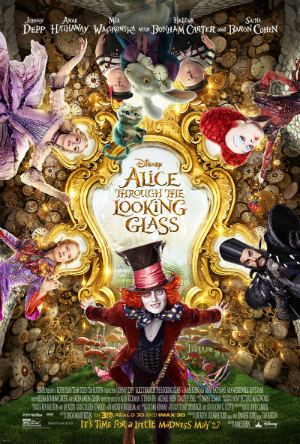 Led by the butterfly named Absolem (voiced by Alan Rickman), Alice returns to Wonderland in order to help her old friend, the formerly mad Hatter (Johnny Depp). Poor Hatter has fallen into a deep depression, brought on by memories of his beloved family. They were all killed when Hatter was but a boy, but lately they are all he can think about. Determined to help him, Alice listens to her Wonderland friends and sets off in search of the Chronosphere, a time-travel device that will allow her to travel back in time and save Hatter's family. Instead, Alice learns that time travel is never as easy as it appears and that the consequences for making mistakes with it can be devastating. While most of the characters from the first film return in some capacity, the admittedly sparse charms are greatly reduced in the sequel's glum atmosphere. Are we meant to be seeing things from the viewpoint of the Hatter? He is suffering from what appears to be clinical depression, a very serious condition indeed, one that can incapacitate the victim and corrupt the victim's view of the world. Or is the intention that the Hatter's emotional condition has spread to all the other characters as well? Curiouser and curiouser, as Alice might say. But this time around, the filmmakers are more interested in the idea of love and compassion setting things right and healing longstanding rifts. It may be a more mature viewpoint, though it makes it more difficult for director James Bobin to maintain interest through long stretches when nothing much happens. For a movie that moves around so much in time, it's difficult to keep track of what is happening and when. Bobin, who directed Cohen in multiple episodes of Da Ali G Show more than 10 years ago, appears content to give the comic actor space to do his thing, but in the context of a family-friendly adventure from Disney, there's not much for him to do, and his scenes simply fall flat. Bobin more recently directed The Muppets, which was a decent slice of entertainment, and its sequel, Muppets Most Wanted, which was not. This film feels like someone poured molasses on it; the pacing is sluggish and the action sequences, such as they are, remain stubbornly difficult to follow. There's little to recommend in Alice Through the Looking Glass. Mia Wasikowska, who saved the first film with a strong and lively performance, again brings Alice to energetic life, but it's to little avail. Lacking Burton's visual panache, the sequel feels less like a trip to Wonderland than an endurance test. The film opens in theaters throughout North America on Friday, May 27. It also opens in theaters in Europe, Latin America, and Asia beginning on Wednesday, May 25 and continuing through the weekend. Tim Burton Would Like Someone To Clothe That Enormous Girl In The New ALICE IN WONDERLAND Clip. 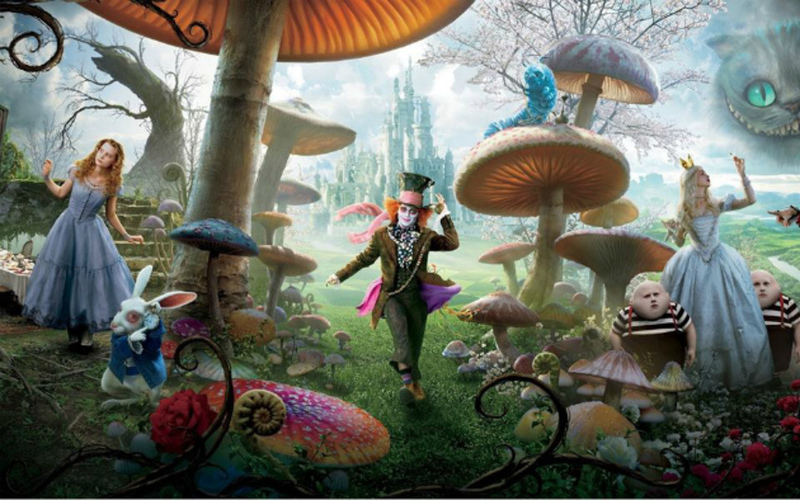 Lots More ALICE In The New WONDERLAND Trailer.